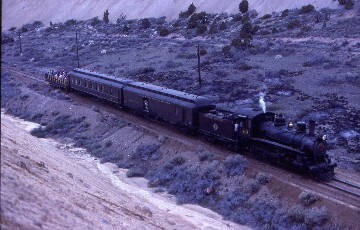 The Nevada Northern was a railroad that I was always fascinated in. It seemed to run from somewhere to no place and the pictures of the freight trains always looked if they ran through some of the loneness places on earth. With names like Cobre, Shafter, Currie Creek, McGill and Ely all seemed like places out of the old west. I always wanted to ride any part of it and when the railroad shut down in 1993 with the last freight train, I thought that I never would. The line was sold to Los Angeles Water and Power and the yard, depot and shops plus all of the equipment were donated to the White Pine Historical Railroad Foundation. They announced that they would be running a steam trip to Copper Flats so I talked to Jeff Hartmann, my good and dear friend who decided that we should go. We made our plans and all to soon the day came. 5/22/1987 Jeff and I had an interesting drive to Ely, Nevada going via Las Vegas and US Highway 93. About two hours north of Vegas we got stopped for going 72 mph in a 70 mph zone which only resulted in a five dollar energy wasting ticket. We stayed at the Motel 6 on 93 south of town. I played the dime slots and won before returning to the room for an evening of drinking before tomorrow's big event. 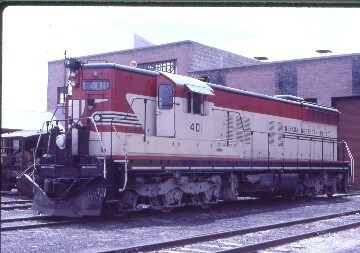 5/23/87 Jeff and I woke up early and went to get some breakfast prior to going down to the East Ely Depot. The stone structure was built in 1907 at a cost of $17,000. We picked up our tickets and went outside shooting a few pieces of railroad equipment left right where they were when the railroad ceased operating. It as if time had stood still. 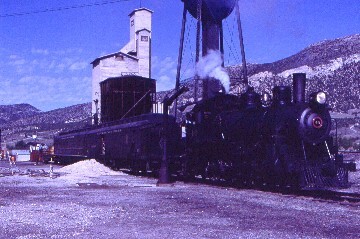 They brought the Nevada Northern 40, a 4-6-0 built in July of 1910 out of the engine shops before it backed into another stall to get the train. The train consisted of the 1890 Pullman Coach 5, 1907 Baggage/RPO 20 and an open car made out of a flat car with benches. They filled the 40 with water and fuel before it pulled down the yard leads before backing in front of the East Ely Depot. When they were ready, Jeff and I climbed aboard going straight out into the open car where we choose to ride. This was going to be the first run of the Ghost Train of East Ely and I was honored to be a part of history. "When we were all aboard this first trip of four that they would run today there was a toot of the whistle and off we went. 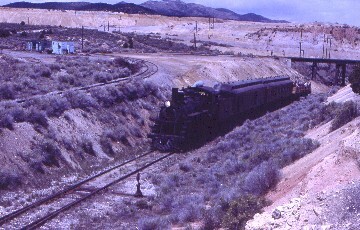 The train backed down the yard lead to the junction with the line to Copper Flats before we headed west. We crossed Murry Creek as we climbed on a fill to reach a hillside which we ran along the side of. We were above Ely with a great view of the mountains that surrounded the valley that Ely is located in. We passed the former location of Calumet as we circled to the west of town. 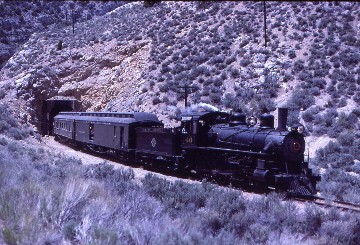 The train headed for Robinson Canyon shared with US Highway 50, the canyon which was created by Gleason Creek. We left Ely and entered the tight confines of Robinson Canyon. We slowly rounded a curve to enter a tunnel that took our train though a spur of rock that projected into the canyon. Upon exiting the tunnel where there were photographers waiting for us, we ducked under Highway 50 and ran up the canyon. There were signs of the former mining practicing all along the route. We ran though Lane City before passing a former mining operation left for time to decay. We ran up to Keystone where we crossed Gleason Creek and turned to head for Copper Flats. We passed the former junction of a line to South Ruth before climbing the grade passing the mine tailings which we extremely high up to a junction at Copper Flats. We backed up a track that led us into the yard at Copper Flats where the train sat for a few minutes. While the train sat Jeff and I explored the whole train which was very interesting to say the least. The place was like it had just been left yesterday with everything just as it had been. The "Ghosts" of the copper industry were alive and well at Copper Flats. The name "Ghost Train" really fits the name of this train well. We ran down another track back to the line which brought us here. We ran back to Ely where we wyed the train before we run to the East Ely Depot where Jeff and I both detrained very satisfied with the trip. Jeff and I looked around the yard before we went to Calumet to photograph and follow the second train of the day which we followed back to Copper Flats then back to town. We had lunch before we took the Shop Tour which was fascinating. The whole place looked as if someone could come to work tomorrow but we knew they would not. We made it back to the east portal of the tunnel for the third train of the day returning to town. We shot the engines and train on display located in town along US Highway 50. 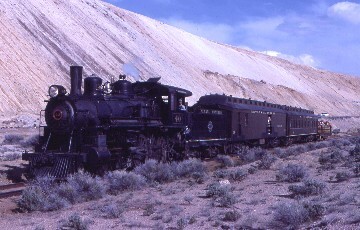 They had the Nevada Northern 93, a 2-8-0 built in January 1909 with an ore train behind it's coupler. 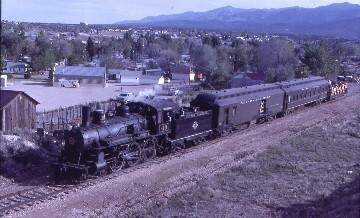 The other train was the Nevada Northern 81, another 2-8-0 built in March 1913 with ex NN 05, a turn of the century Combine/Coach. We shot the fourth and last train of the day at the west portal of the tunnel and followed it out and back from Copper Flats. Being up there this last time before the train arrived only the wind made a sound passing through the deserted location called Copper Flats. We followed that last train back and called it a day of train riding and chasing. We went and had dinner before playing a few more dime slots and winning prior to drinking the rest of the night away in the room. Jeff of course hardly ever drinks. 5/24/87 Jeff and I were up early as we were driving all the way back. We ran down to Caliente before we decided to follow the Union Pacific's tracks through both Rainbow Canyon and Meadow Valley Wash over fifty miles of dirt roads through the middle of nowhere with Jeff wondering where I was taking him. We managed to photograph a pair of freight trains. We made our way down to Las Vegas before stopping at Whiskey Pete's for a few minutes of gambling for me as well as breaking up the drive. We made our way the rest of the distance to home ending a very interesting trip to Ely, Nevada and the "Ghost Train of old Ely!"